Final Day: Meet Me at the Beach blog tour & Giveaway! Today wraps up the blog tour for MEET ME AT THE BEACH, the contemporary small town romance I wrote with my hubby as VK Sykes. There are five stops, which means five more opportunities to enter the giveaway! There’s also an interview, a new excerpt, and a review at some of the stops too. Thanks so much for celebrating release week with me! 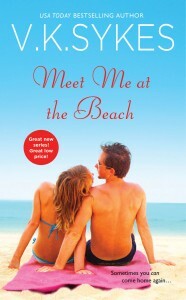 For more info on MEET ME AT THE BEACH, check out my VK Sykes website. I would love to be on a beach right now, so tired of the snow and cold. It’s a gruesome winter, Quilt Lady!